Online registration has closed! But you can still register on the night. Our new Lantern Walk is a moving celebration of life and the chance to reflect on those we love but are no longer with us. You do not need to have any previous connection to East Cheshire Hospice to remember someone in this way. The Lantern Walk is an opportunity for you, your family and friends to come together and walk a choice of a 2.5km loop, 2 loops for 5k or 4 loops for 10k through the beautiful grounds of Capesthorne Hall in memory of a loved one. The walk takes place at dusk and walkers will carry a paper lantern to light the way along the route as the sun sets. During the walk, attendees will also have the opportunity to float a lantern on the beautiful lake at Capesthorne, in celebration of the life of the person or people they are remembering. 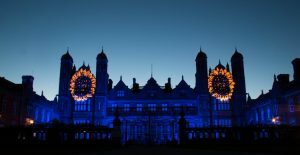 The evening will come to a spectacular end with a firework display to Light Up The Night. Walkers are encouraged to raise funds for East Cheshire Hospice to help fund the care of patients both now and in the future. The event will include music, entertainment, food/drink and merchandise. The whole family is welcome to this moving and uplifting evening of remembrance. Our registration price of £20 for over 16’s and £15 for ages 5-15 includes entry to the event, a unique Light up the Night T-shirt and your very own hand-held paper lantern that you can take home as a keepsake at the end of the night. Included with your entrance fee is a unique Light Up The Night T Shirt, a Lantern of Remembrance to light the night and a floating lantern that you can personalize and float on the beautiful lake at Capesthorne in memory of a loved one. As your entrance fee only covers the cost of the event, we do ask that everyone tries to raise at least £50 of sponsorship. Every penny you raise really does make a huge difference in helping us to continue to provide care in your local community. Download a fundraising pack full of handy tips and ideas to support your fundraising and make your own Just Giving Page by clicking here. Alternatively if you would rather not raise sponsorship, you are able to make a donation to the Hospice of £50 when you book your place. 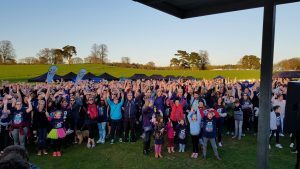 This short video shows the magic of Starlight Walk, our memory walk in 2018.